It’s Fashion to Flowers Thursday! 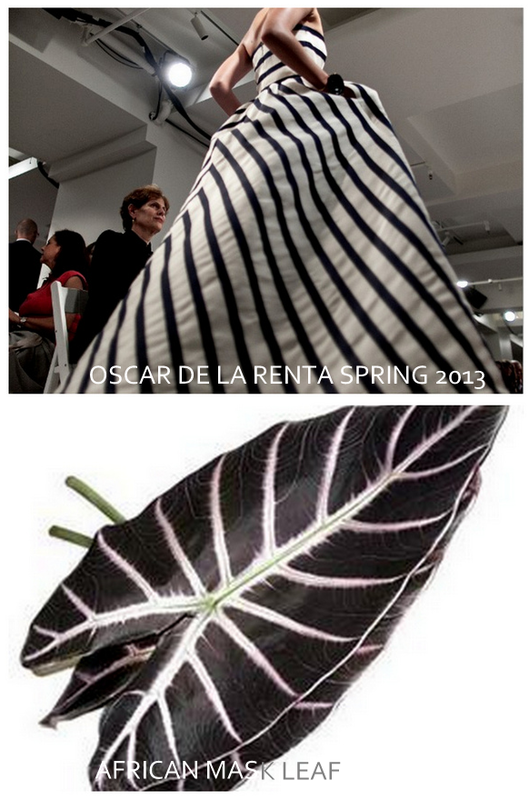 Check out this Oscar de la Renta Spring 2013 gown to end all dresses matched with the African Mask Leaf. We saw this dress first on the Twitter feed of @OscarPRGirl and like a supernova the image of the dress spread like wild. Could we have found a better horticultural pair for her than the African Mask Leaf? Available all year round, African Masks are plants that need serious TLC, lots of clipping the old leaves to make room for the new ones. Our fashionista rocking this dress at her dinner party will have a carefully cultivated selection of African Mask Leaf along her table and in her lounge, a not-so-subtle nod to her color scheme and ability to access the rare and finite.